The Official music video for All Time Low's song "A Love Like War" featuring Vic Fuentes off All Time Low's new album 'Don't Panic: It's Longer Now!' OUT NOW on Hopeless Records! Watch the A Love Like War video below in all its glory and check out the lyrics section if you like to learn the words or just want to sing along. Preview and download the music video for A Love Like War (Feat. Vic Fuentes) ... They all work so well together. I love them! <3 ... Top Music Videos by All Time Low 1. 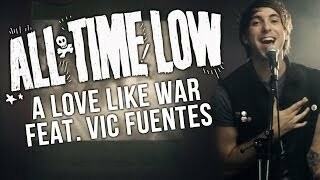 Music video for All Time Low song "A Love Like War" featuring Vic Fuentes off 'Don't Panic: It's Longer Now!' out SEPTEMBER 30th on Hopeless Records!